Project completed as part of the 2019 Microsoft Design Expo. This year’s theme was Empathy at Scale. 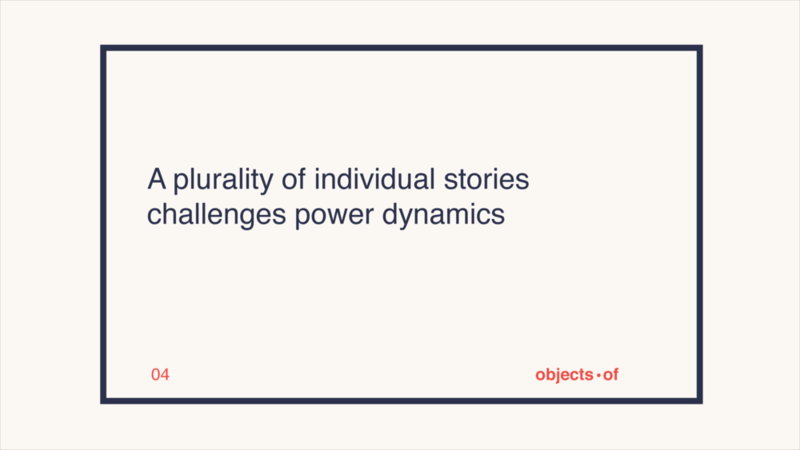 By focusing on a plurality of stories written by individuals, not a disembodied third party we hope to foster a more nuanced response when encountering people who we perceive as different from ourselves. We propose a new framing for empathy known as Sonder. Most of us are regularly exposed to commercials, social media posts, news stories, and second hand accounts of just this type of reductive narrative—and we have learned how to ignore or not engage with them. We hope to reach people who lack exposure to a plurality of narratives, people like Vee and Georgia. A recent study published in the Atlantic found that 40% of Americans lack exposure to other races, ideologies, and religions. This suggests almost half of our nation has little more than a one-dimensional picture of people different than them. Our goal is to show people a reality beyond binaries, assumptions, and tokens through representing multifaceted stories that demonstrate that we're all just people. Our website features an interactive map which shows stories and objects all around the country. Additionally, people can submit their stories here. Ground stories in physical form so that that the impact can persist and feel relateable. We were challenged to come up with a design response for the theme, Empathy at Scale. My team was interested in a public installation piece that, through obfuscation of appearances, would prompt reflection and curiosity, before prejudices could form. Blind Date with a Book was one such point of inspiration, as well as the research I had done for Simon Says on the benefits on anonymity in online spaces. In thinking about Empathy at Scale, we wanted design response to reach our audience not only geographically and spatially, but temporally as well. How might we give people the framework to empathetically navigate their world in a sustained, actionable way? We envisioned the experience where new information and revelations would be revealed at subsequent stages of interaction. The issue we had with many installation and museum pieces was that it felt like a ‘one-and-done’ experience; people would have a moment of reflection at the site of the installation/art piece, but not necessarily carry those thoughts through their day to day hereafter. Our response would need to reinforce empathy long term. We wanted our project to be located in publicly accessible places such as parks, cafes, and other communal spaces so that people from all walks of life could contribute to and interact with our installation. Our research informed us that curated spaces such as museums or galleries, even those that were free, deterred certain people because of the prestige associated with them. The first version of my storyboard set the story of Objects Of in a cafe. We intentionally chose the point of view character to be someone of privilege, encountering Objects Of.